On May 27, 1999, the Sierra Madre Historical Preservation Society and the Sierra Madre Public Library entered into an agreement whereby the archival collection became jointly owned by both institutions. The archival collection consists of historic documents, photographs, slides, maps, sound recordings, oral histories, moving images, scrapbooks, ledgers, news clippings, books, works of art, and ephemera that tell the story of Sierra Madre and the nearby San Gabriel Mountains. A selection of digitized photos is available in the Library catalog, on Flickr and in Worldcat. Offers to donate items to the Historical Archives are welcomed. Contact the Library Archivist (contact information at right) or the Historical Society Archives Chair (contact information on the Board page of this website). Staff review all donations to ensure the material conforms to the selection criteria in the Library’s Collection Development Policy. 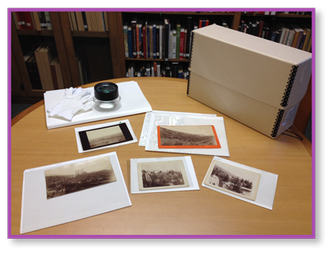 The public can view material from the Archives during Library open hours. Appointments are highly encouraged so that the most relevant information can be made available. Call the Library at 626-355-7186 to schedule a visit. Library staff maintain the Archives by documenting the collections, ensuring their preservation, providing outreach to the community and answering reference requests. Volunteers assist staff with various indexing, filing and research projects. This collection consists of donated books of special California interest, particularly old or rare editions or signed copies. These items are designated for in-Library use only. The rare book collection is accessible through the Library catalog. This circulating collection focuses on the history of the State of California and specifically the Los Angeles area, Sierra Madre, and surrounding communities, but also includes books on a wide range of California topics such as art, architecture, geology, travel and natural resources. The circulating California collection is accessible through the Library catalog. Local newspapers on microfilm include Sierra Madre Weekly, The View from Sierra Madre, Highlights, Sierra Madre News, and Sierra Madre Vista. A microfilm reader is available to the public. The Mountain Views News and recent issues of the Sierra Madre Weekly are available in print form. The Sierra Madre Public Library possesses a small non-circulating collection of paintings, sculptures, and art prints, some by Sierra Madre artists. To schedule a research appointment, click this link. You can click on the Board page on this website to find the contact information for the SMHPS Archives Chairman.